Shah Rukh Khan and Kajol coming together is always the preferred couple for an average film viewer. Add Karan Johar to it, its like treat for them. Well this is the majority’s view. There is this minority crowd like me, who loathes him and his movies. Mainly because it is filled with cliché’s, candy floss, NRI life and USA. We can’t blame him also, because most of his revenues come from outside India. However, this time there were lots of differences. The story was not set in a big city; there were no big families present; Not much glamour quotient; controversies before movie; not much campaigning (no, that was done by us and media: D); no jatka and matka songs; and last but not the least, it was about common people. It was about an issue, something we’ve seen and something we could relate to. Shah Rukh Khan and Kajol have given good performances before. However, Karan Johar has not delivered anything stellar. Kuch Kuch Hota Hain was during my school days. If I see it now, I will laugh at it. Kal Ho Na Ho was fresh, but I reduced marks because it was inspired from Anand. K3G was one big boring on screen soap opera. KANK – nice idea but totally lost it towards the end. However, MNIK is his first step towards good cinema. He has taken one strong step. This has been acknowledged by many including me. Hats off for the movie! The movie takes cues from the tortures many Muslims and to a small extent Sikhs due to the aftermaths of 9/11. Starting in the sequential order, the story starts with a small family in delhi. Two kids and a mom. The lovely Zarina Wahab plays the mom. The elder son is Autistic and gets all her attention. The younger is quite brilliant and yearns for her mom’s attention which he rarely gets. Tanay Cheda plays the autistic child with ease. Zarina Wahab crosses the t’s and dots the i’s. There is an important message that she gives. “There is no hindu or muslim, there are only good and bad people”. She explains this in a subtle way. A scene to watch out for! Years pass by, Little guy Zakir goes to US, settles there and marries. It’s the turn for Mom and Rizvan(SRK) to go there. Mom dies before that. SRK meets Mandira (Kajol) – a widow with a kid Sam in San Fransisco. No points for guessing that he wooes her. After all he is SRK 😀 even if he is autistic. They start living their lives together, Kajol starts her own business. Everything is rosey till 9/11 happens. Chinks start appearing one by one. Business closes down; Sam is subject to racial attacks etc. Due to unprecedented turn of events Sam dies, Kajol blames it on SRK’s Khan Name and then SRK goes on a journey to prove that ‘Khan is not a terrorist’. That’s all from the story part. The story is quite predictable, but keeps us glued till 3/4th of the movie. In the last quarter of the movie you will start feeling restless. The movie is filled with a good mix of laughs and emotional parts. KJo ensures that he doesn’t go overboard on these aspects. He is backed by an awesome technical team. Ravi K Chandran doing the cinematography. The visuals are splendid like it has always been in KJo movies. Nice dialogues and story sequence. The casting is also quite good. I feel that the movie could have been shortened by a little bit. Music was given thumbs by everyone since its release. The move doesn’t waste much time on songs, and mostly it goes with the narrative. Tanay Cheda puts in yet another good performance as SRK junior. Jimmy Shergil is ok as SRK’s brother. His wife played by Sonia Jehan, is a very good character. Makes her mark on us with the limited time she has. Parvin Dabas, Arjun Mathur & Sugandha Garg have also done their job as the reporters in the movie. Kajol – I don’t have to tell anything about her. She is ravishing as usual. Lesser glamour quotient than usual and less bubbly. SRK – The man comes with yet another credible performance after Chak De. It is evident that he has worked quite hard for this role. He appears a little aged in the scenes. Lot of ladies would be heartbroken at this. He is funny most of the times with his genuine comments. The character is inspired with an equal mix from Dustin Hoffman of Rain Man and Tom Hanks of Forrest Gump. SRK doesn’t match them, but he is quite good. This performance will be remembered as on of the few roles where he has actually acted. The only area where he loses out is when his SRK’ism takes over. 😀 Well that can be discounted. Striker strikes just off target! 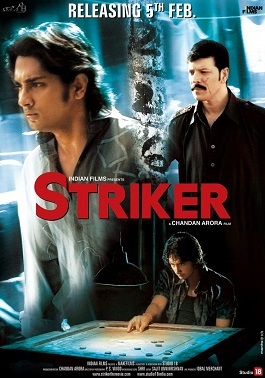 Striker was one movie that silently came. I am sure that many of the junta haven’t heard about the movie. Anyways. This was once movie that that caught my eye because of Caroms, Sidharth, Padmapriya, Songs and premier on Youtube. What a killer move. Not many would have done that. They have also made a point that it wasn’t available for India and it was a streamed version. Nice touch on that front. No matter you do anything Pirates got hold of their quality. 😀 For me, I could watch my first online movie and that too legal. 🙂 I am indebted to the guy who thought of this. The movie already has over 200 thousand views. The movie is set in December 92 in Mumbai. The time of communal tensions. So one thing is sure, no mobiles and freaky gadgets. Its been a long time since I’ve seen a movie like that. The movie starts with Siddharth (Surya) getting to his place – Malwani, where there is a curfew in place. A typical ghetto in Mumbai. He is part of typical family living in a small kholi. In bits and parts, his growing up and his fascination towards caroms is shown. Surya’s brother has a fascination with Caroms, he in his teens go on to make a bet against Aditya Pancholi (Jaleel) player and unfortunately looses. Surya’s tryst with Pancholi starts over there. Lemme introduce Pancholi, he is DADA who controls the area and runs carom games. Surya is a typical lower middle class guy, who is struggling to earn. He also gets bitten by the gulf bug. He pays money to some phoney guy. Financial crunch and slowly gets into carom playing for money. Carom is his passion and his major USP. There is this surprising goofey character – Ankur Vikal ( Zaid); he is part of Jaleel’s gang and Siddharth’s friend. He runs into trouble every now and then. He is the one who gets our hero into trouble every now and then. Enough of stories. On the good points, the first half had the right pace. The pace is totally lost in the second half. Carom is used as a vehicle to carry the story and not much emphasis is given on it. So a carom n00b can also relate well to it. Attention to detail is quite good, be it the lingo and the dress. Songs have been put mostly into the background. The choice for cast is quite good and the main characters splendid. The animation on the company logos is one of the best I’ve seen in recent times. Don’t miss that part. Siddharth remembles his character in RDB most of the time. Overall a good job. Ankur Vikal (Maman of Slumdog), nice to see him back. He has done some good acting. Would like to see more of him. Adithya Pancholi is another surprise package of the movie. Power backed performance. Takkar ka muqabla. Anupam Kher gives a power backing performance as Inspector Farooque. The inspector or the ‘3 star’ responsible for law and order. A guy of principles and keen to keep law and order. On the negatives, a talent like Padmapriya has been totally wasted. Its disheartening. I am wondering why did she choose the movie. She had a track which could have been totally avoided. Vidya Malwade & Seema Biswas was there but without much impact. There is a love interest in the form of Nicolette Bird (Noorie). She hardly talks and just vanishes in the first half. She reminds you of Giselle Montero of Love Aaj Kal. I wonder if there is a trend starting on that! Final Note: I have not much gripes over the movie as I didn’t have to spend anything on the movie thanks to the producers. Its a movie I would recommend to watch in the coziness of your home. Rahul – Symbol of Tomorrow? Rahul Gandhi had his share of limelight on Friday, 5th of February 2010. He is always in the limelight. I would also exaggerate and call him the darling of the media. Anything he does is news, be it sleeping in a hut, wandering around alone in Kozhikode. Anything around him is news. Well he is the apparent heir of the Gandhi Nehru clan and of the party. What was special this time? He visited mumbai amidst the ‘Mumbai 4 All’ campaign. The controversy kicked off with Mukesh Ambani stating that Mumbai belongs to India, and not Maharashtra’s alone. That was more than enough for the whole of the Thackerey clan and Shiv Sena to comment. Luckily the issue died down soon. Soon enough IPL season 3 auction happens where all the pakistani players players were snubbed. Deliberate or by chance. Everyone had their own reasons. Shar Rukh Khan was the first one to comment that it was not fair on our part. The first family of Maharashtra – The Thackerey’s didn’t like his. They branded him a traiter and pakistani. They said they wont let his latest movie be shown in Mumbai. Initial thoughts were that it was just cheap publicity stunt that usually happens like how it happened in the case of 3 Idiots. The turn of events suggested otherwise. This led to the #Mumbaiforall campaign on twitter. People voiced their opinions one by one. The voices were strong that it was even reported in the media. There was obviously security around. SS then went on to say that it was Mussolini style drama. Comon! The reason why I liked all this drama from Rahul Gandhi was that, he had the balls to accept the challenge and travel in the local trains of mumbai. This would atleast give some courage to the people around. I am sure people would have seen this publicity stunt in a positive light. Shiv Sena – the world is becoming smaller and we are in 21st century. Evolve or you will be left behind in life. Showing muscle power wont work always. Once people awakes, you will be singled out and will be labelled as insane!. Improve and take up issues which are relevant to people. Not the ones that wont give any value addition to people. Malayalam film industry lost yet another star. A star that almost everyone of us keeps in heart. Such are the characters that he has played. The fat dark guy with a unique voice. I am feeling short of words to express about him. Cochin Haneefa in my opinion would be the most remembered comedian after Jagathi Sreekumar. Think of any famous movie, he will be part of that. Hydrose of Kireedom; just see the change in him after he becomes part of Mohanlal’s team. See the maturity and the improvement in him in the second part – Chenkol. I remember how much he made us laugh as the uncle in Punjabi house, dumb manager in Friends, police inspector in Parakkum Thalika, pedali in Meesha Madhavan, etc. He was even good with negative roles, the one that comes to my mind is Sabapathi in Pathram. He was shown as a no good policemen. He literally shocks you at the end. You are literally taken aback when he stabs from the back. The look on his face. Wow! Hats off. There are couple of other mentions like Mahanadi – the Kamal haasan starrer; where he was a prolific villain. Sadly I couldn’t see the movie. Not many knows that he has directed an awesome movie. Vatsalyam starring Mammootty. Even I didn’t know. How can you expect a comedian like him to direct an intense movie like Vatsalyam. He leaves us at a time when the malayalam movie industry has been losing star and there are no good comedians coming up. You have been awesome and we will surely miss you. PS: I’ve been lucky to meet him once at my friend Madhu’s wedding. He is just as you see him in movies. Cracking jokes always. Will always remember that.